On SImchas Torah of 5769, I was working for Rabbi Levi as a Shlucha with another girl. He was extremely excited that it was Yom Tov, and apparently the entire community was excited as well. Rabbi Levi gave out L'chaim, led a lot of joyous, exciting dancing, and encouraged the women on the women's side to dance as well. Near the end of the Hakafos, when most other people had left, there were a handful of people who stayed in the Shul, dancing with the Torah's and saying L'chaim. It was when it was emptying out, that Rabbi Levi asked each person in the Shule to make a Hachlota. After each person made their hachlota the group of men did another round of dancing, around the Bimmah. One man promised to come to the morning Minyan twice a week. Etc. After each person made their Hachlota, Rabbi Levi got more and more excited and joyous, and encouraged another round of wild dancing. There was one man who was from out of town, and spoke in broken English. He hardly understood what was being said, but thoroughly enjoyed the dancing. Rabbi Levi told him in a booming voice, "repeat after me:" "I" , "I", "Will", "will", "only", "only", "marry", "marry", "a Jew", "a Jew" !!! After he repeated these words he gave a loud bang to the Bimmah, and they all rejoiced. We learned later on that this man had been dating a non-Jewish woman. As can be seen from this story, and as I learned first-hand after watching this remarkable Rabbi, he inspired people to push themselves, to reach greater heights in Yiddishkeit and Chassidishkeit. Additionally, every Friday night, at dinner, surrounded by their many Shabbos guests, Rabbi Levi would ask each guest to share their inspirational thought for that past week. So often the guests shared something special that they learned or experienced with “Rabbi Levi” or Miriam, and their four children, Chaya, Mendel, Mirel and ‘baby’ Zalman. In between the inspirational stories that left us all teary, Rabbi Levi would teach everyone his “favourite niggun”. And even though most people hadn’t heard the niggun before, with Levi’s powerful voice, each guest knew the niggun well by the time the meal was finished. Something else that deeply touched me about Levi was that he was able to balance Shluchos, and family time so well. I remember many times when he would help his wife Miriam, put his K”H gorgeous children to bed. I remember coming into Mendel’s room one day, and seeing Mendel being read a story by his Tatty. They read the story holding it up to the ceiling so that Mendel could see all the pictures properly. On a personal level, Levi inspired me to go on Shlichos for life. When I got engaged and introduced him to my Chosson, he was only satisfied once he knew that we were planning to go on Shluchos. And it was because of the life-changing and amazing year that I spent in Tysons Corner, under Levi and Miriam’s guidance that I knew that I could go on Shluchos for life. 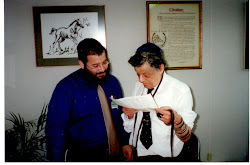 Rabbi Levi’s care for others, his concern that the people he inspired were constantly moving forward in their levels of Avodas Hashem, and his passion for Shluchos is my inspiration. I am forever grateful. Thank you, my cousin, Levi.